Last Week in Review: News headlines move markets. Forecast for the Week: The Fed will be focused on inflation. View: Use video and add value to your marketing and service. “I read the news today, oh boy.” The Beatles. 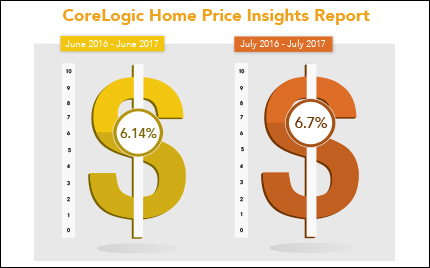 While home prices continued to rise, it was headline news that boiled Bond prices. Also of note, the second read on second quarter Productivity rose to 1.5 percent from the first read of 0.9 percent. However, within the report it showed that the inflation reading unit labor costs declined to 0.2 percent from 0.6 percent, further signs of lower inflation. Low inflation is typically good news for fixed assets like Mortgage Bonds and the home loan rates tied to them. The week’s other economic reports had little impact on markets, but the news headlines about Hurricanes Harvey and Irma, the debt ceiling and North Korea had people on edge, including investors. 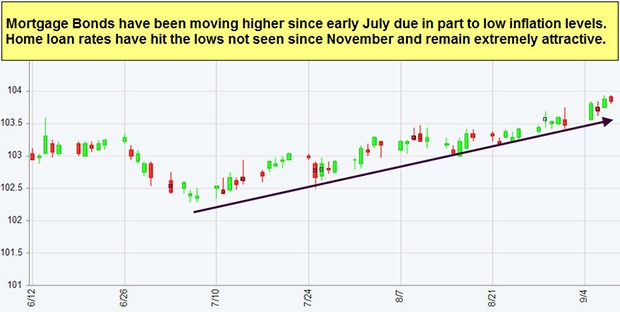 The uncertainty surrounding these events pushed Bond prices up, keeping home loan rates near historic lows. If you or someone you know has questions about home financing or home loan rates please contact me. I’d be happy to help. Fed members will keep a watchful eye on inflation. Economic data releases begin on Wednesday with wholesale inflation numbers from the Producer Price Index, followed by the Consumer Price Index on Thursday. Weekly Initial Jobless Claims also will be released on Thursday. On Friday, Retail Sales will be delivered along with the Consumer Sentiment Index and the Empire State Index, which provides a look at regional manufacturing. As you can see in the chart below, Mortgage Bond prices have hovered near 2017 highs, leaving home loan rates near historic lows. According to marketing data collected by Hubspot, 43 percent of customers want to see more video content from marketers. Thankfully, your smartphone or computer can help produce good quality videos at no cost. Here are four creative ways to use video to promote products or services, serve clients and grow your business. The About Us page is one of the most visited pages on a website following the home page. This makes it a great spot to place a video introducing your company and team, your mission, a tour of your facilities or all of the above. Whatever you do, don’t let this valuable real estate go to waste. Product or service demonstrations are more engaging and helpful than static advertising, so instead of telling people what you do, show them. Demo anything from the most common mistakes customers make, to how your process is superior, to a Q&A about frequently asked questions. Client presentations are a great way to put desktop recording to work, and you likely have free recording options already on your computer. It’s not always convenient for clients to meet in your office, so recording a presentation can be a way to show you clearly understand how to take care of busy clients on the go. Capturing testimonials from happy customers is always valuable because these testimonials provide third-party validation to prospects that you deliver great service. There’s no need to get fancy. Capture a few quick videos from your smartphone. Videos can easily be sent from your smartphone to social media sites. You can also create a YouTube Channel to easily share your videos in email or on your webpage. YouTube provides sharing tools for these as well as social media. Plus, YouTube provides the options of private, public and unlisted settings so you can keep client presentations private. Use these ideas as a springboard for including more video in your marketing mix!